Review: This is a very direct storyline about the struggles a 17 year old single father faces while raising a newborn and trying to go to school while having a relationship. The only “hurdle” in the story is Zach’s constant worry. He worries about being a good father. He worries he’s too much of a burden to Wil. He worries about making ends meet. He worries about being in a safe neighborhood. He worries about distancing Wil’s family. Etc. Zach is very insecure and this is really the only angst in this story. On the one hand, I enjoyed watching the storyline roll out – seeing Zach navigate these hurdles and admiring him for being willing to do all this on his own. On the other hand, I kept scratching my head … Why would Wil want any of this? (Not that he shouldn’t want it – but WHY does he?) The authors do not do a good job of giving Wil motivation to be with Zach other than an initial chemical attraction at the beginning of the story. The other issue that had me scratching my head was the author’s choice to make Zach 17. He could have had all of these difficulties at 18, 19, 20 etc; but at 17 he also has the hurdle of legalities and the uncomfortable skeeviness of “statutory” issues. While I appreciated the conflict Wil’s family situation brought to the story, I did not understand Wil’s response. In fact, Wil was the most misunderstood character in the whole story. I felt like I understood his parents and sibling’s motivations more than his at times. All in all, it was an interesting read. It was thorough and descriptive. The drawings – while a little startling to run across – were cute. 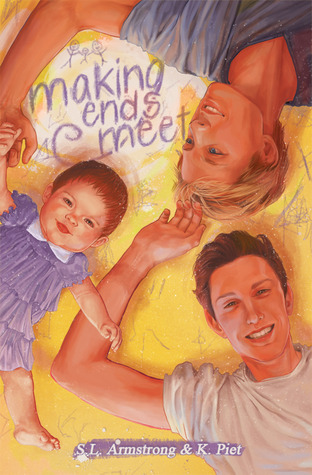 For someone in need of a low-angst story involving young lovers and a baby (low steam), this is your book. For someone looking for a romance that burns up the pages – keep looking.